And here’s the first of some great books I’ve been recommended in the past – and loved so much I keep recommending them to others! 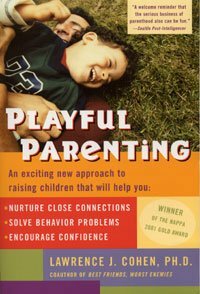 If you don’t want to go through the whole book, why not check out the website: www.playfulparenting.com. There are also LOADS of other sites that talk about the techniques in this book, and also one I found that gives a summary of all the chapters, which gives a good overview of what the book is all about:http://www.webgroups.biz/playful_parenting2.php. So what is the book actually all about? Playful Parenting means joining children in their world of play, focusing on connection and confidence, giggling and roughhousing, and following your child’s lead. Find out tips on using play to solve problems like a clingy child, when siblings are fighting lots, if a child has been having power struggles with you…and more! P.S. Have you read this book before? What were your thoughts?